Glass pool fence panels held in place by posts. Glass pool fencing is the material that gives the most premium feel to a pool because it looks the best. And that’s because in most installations of glass panels, the fence can hardly be seen. Glass pool fence panels are made from safety glass that comes in various thicknesses of 8mm, 10mm and 12mm and the panels are used to create glass pool fences in the styles of frameless, semi-frameless or channel set. Glass panels are held in place by posts and spigots of various designs which are drilled or bolted into the concrete, brick or paving. 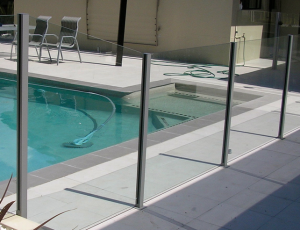 For more, visit our glass pool fencing section. Aluminium pool fence panels are much more cost effective, resulting in a cheaper overall cost to the fence, but they do obscure the view of your pool which for many people is one of the joys of owning a pool…having it as a visual feature of your backyard. Aluminium fence panels are typically made with tubular upright bars joined by upper and lower rails. Made from welded aluminium or steel that is then powdercoated and comes in a variety of colours. Come in standard heights of 0.9m, 1.2m, 1.5m, 1.8m and standard widths of 2.4m or 3.0m. For more, visit our aluminium pool fencing section. Usually made of steel and finished with a galvanised coating for protection. Can be powder coated in colours. Has either a folded triangle pool panel, or tube top and bottom. 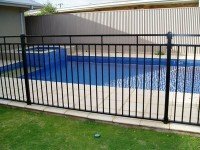 These type of pool fencing panels are considerably cheaper than aluminium or glass panels and are also commonly used for residential fencing. Glass Pool Fencing, Pool Fencing Panels panels. permalink. When do you need temporary pool fencing?